Welcome to Victory Gear, your source for excellent vintage militaria. 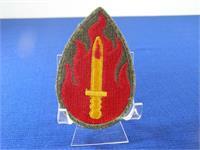 We offer fine military collectibles from World War I, World War II, the C.B.I. Theater, the Korean War, Vietnam War, as well as the Civil War. Our collection includes edged weapons, U.S. patches, American, European, German, and Japanese war memorabilia, and more. Buy with confidence from VictoryGearUSMC.com. Each item comes with a guarantee of authenticity. We offer a liberal three-day inspection period and a no-hassle refund policy. New items are added frequently. If you need an item not shown in our catalog, please feel free to contact us. If you would like more photos of an item, please don't hesitate to contact us. Disclaimer: When an item is listed as (NEW), it means that the item was recently added to the site. It does not mean that the item is brand new.